The leaves are needless with flat pointed tips. The upper surface of the leaves has a bright color of yellowish-green with one groove down the center. The lower surface is paler and needles looks like they are standing around the twig. 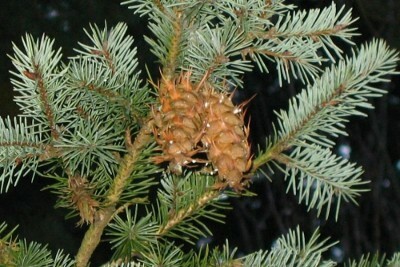 The cones of this tree are around 5 to 11 cm long. When they are young, they are green in color but as they mature they turn gray. Between the scales one can see long three prolonged bracts. Seeds are winged at the tip. The bark of douglasfir is smooth with a grey brown color and gummy blisters when young. However the bark becomes thick when it matures and deeply grooved. The ridges are dark reddish-brown in color. Both the interior and coastal douglasfir, adapt to different environments. The interior grows in various habitats which include open forests with pine grass and mosses beneath. The coastal one grows well since the coast sides are more productive. It grows with western red cedar and grand fir, with a lush of hackberries and sword fern beneath. The tree’s seeds are eaten by many animals which include squirrels, mice, shrews and crossbills. The biggest enemy is bear which scrapes off the bark of the young tree and eats up the sap. This may kill the tree. Douglas fir wood is used for various activities. Most people love it because of its durability and hardness. It is used for heavy duty construction and commercial building. There are other people who use the wood and boughs for cooking, making handles and making floors.